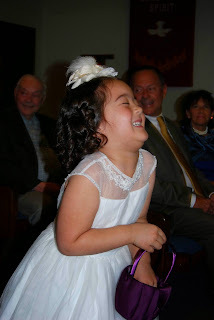 That girl- she cracks me up!! 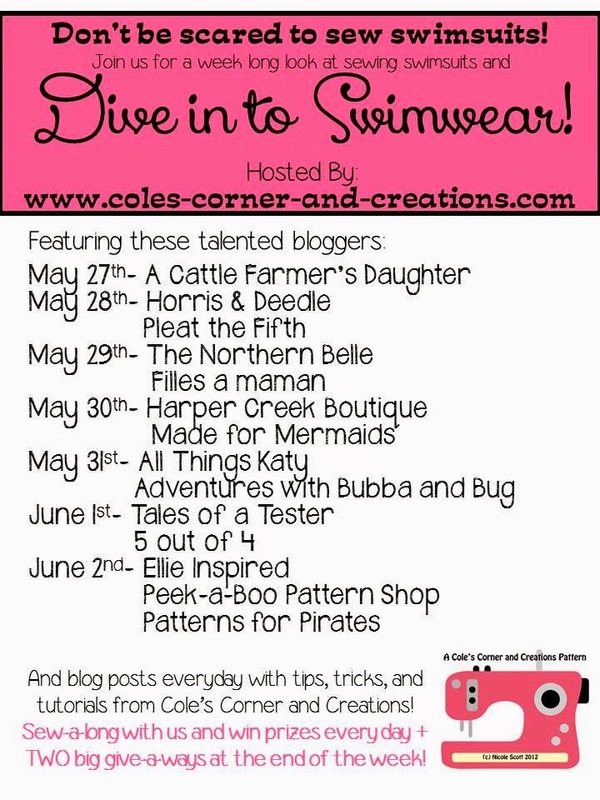 If you are just joining us for the #diveintoswimsuits Blog Tour, be sure to catch up (and continue) reading all of Nicole's wonderful tips, hints and bathing suit how-tos at Cole's Corner and Creations. If you'd like to sew along with us (and, I hope that you will!! 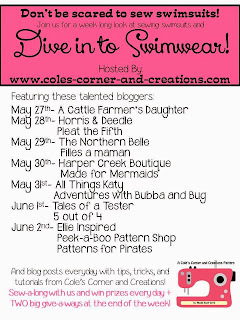 ), this week, be sure to share your pictures with the hashtag, "#diveintoswimsuits" on the Cole's Corner and Creations Facebook page. Also, be sure to check out how you, too, can win some patterns/prizes of your own (at the end of this post)! It may only be May, but the temperatures here in the Carolinas tell me that it's SUMMERTIME!! With the hotter temperatures and longer days, that means that you can find us poolside. Lil' Miss is a fish and she LOVES to swim (and, this is totally biased, but she is an AWESOME swimmer)!! 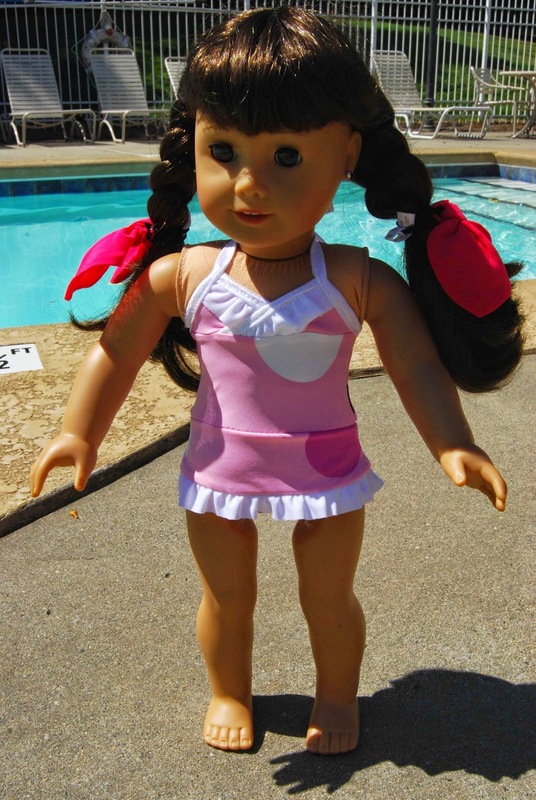 With weekly swim lessons and afternoons at the pool, Katy is hard on her suits. It's always helpful to have an extra, dry suit available. One of my goals this spring (leading into summer), was to learn how to sew a bathing suit. It was a self-imposed challenge- conquer sewing slippery swim knits and create a durable suit that can withstand the rigors of an active five year-old swimmer. With the help Cole's Corner and Creations, three swimsuit patterns (The Lakehouse Swimsuit, the Bow-a-Licious Swimsuit and the All 4 One Swimsuit), I was able to meet and accomplish (and surpass!) my goal! -The Lakehouse Swimsuit is written for sizes 1/2-16. -The Lakehouse Swimsuit features an empire waist and sweet bow detail. -The Lakehouse Swimsuit PDF sewing pattern features digitized, no-trim pattern pieces (love that!). 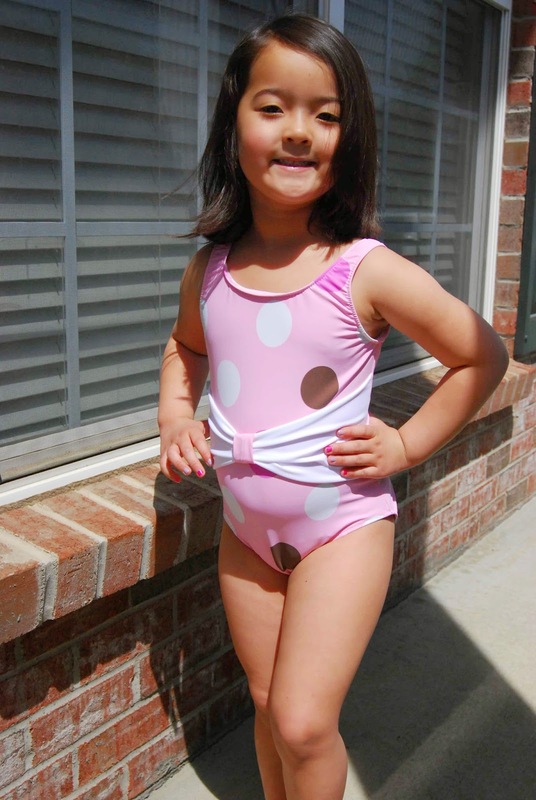 -The Lakehouse Swimsuit can be used for a bathing suit and/or leotard for gymnastics and/or ballet class. -The Lakehouse Swimsuit PDF sewing pattern includes a sizing chart and fabric requirements chart. 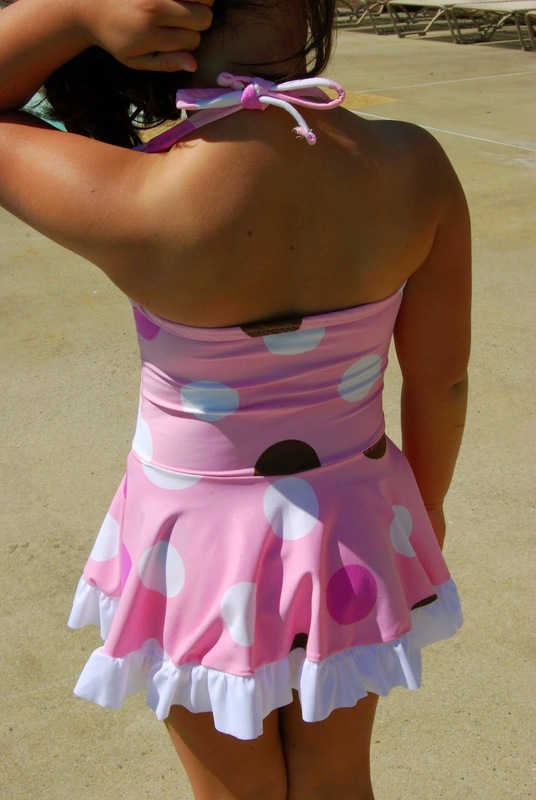 For my daughter, I sewed up a size six swimsuit with bow. I fully lined the front of my daughter's suit for a little more modesty. I wasn't sure how see-through the white waistband would be, once wet (turns out that that it was fine). I love coverage on The Lakehouse Swimsuit. 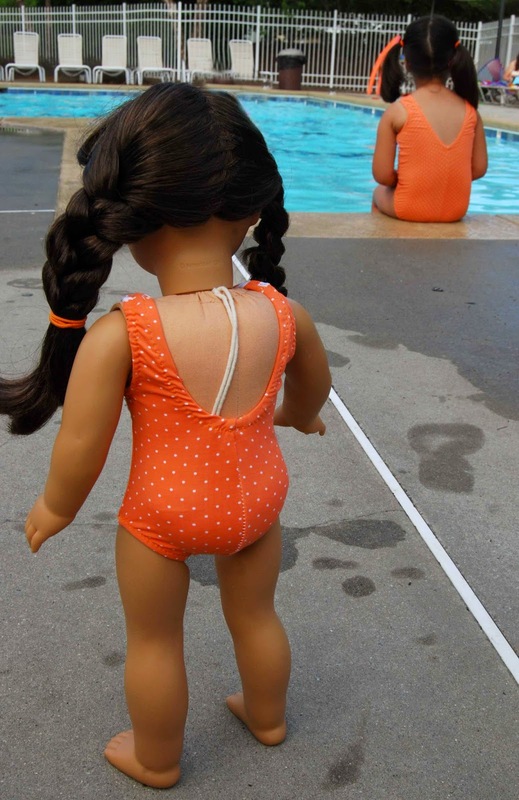 With it's high neckline and adequate bum coverage, The Lakehouse Swimsuit definitely fulfills mom's desire to keep her little girl, a little girl. The empire waist is flattering and the sweet front bow is girly and fun. The shoulder straps stayed up and in place the whole time Lil' Miss swam and played and splashed around. 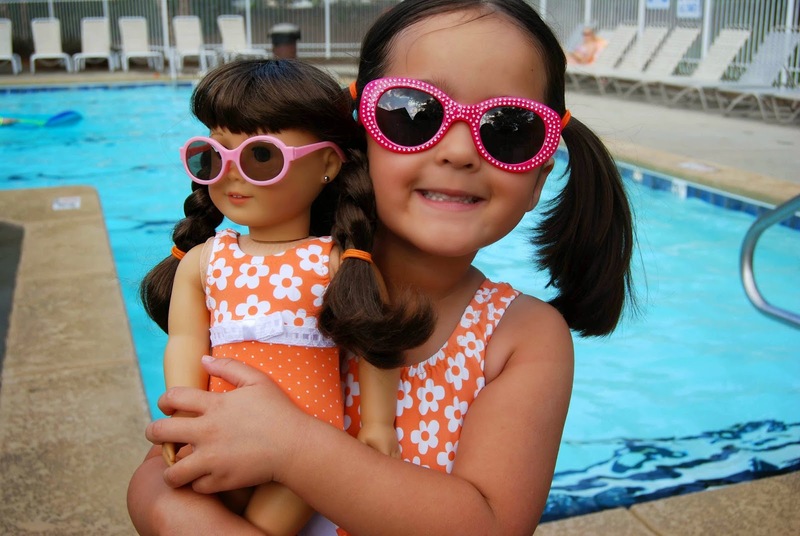 This is a HUGE plus when it comes to swimwear for active children!! 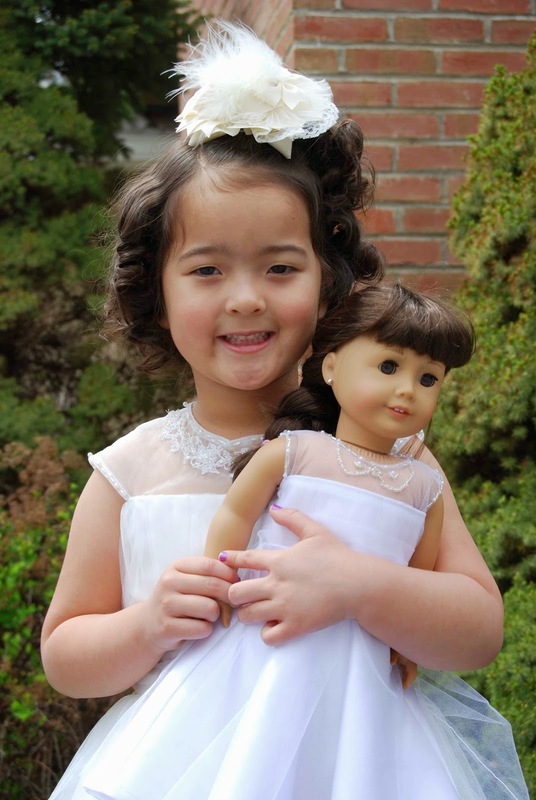 Cole's Corner and Creations loves their American Girl dolls! Lil' Miss LOVES that Cole's Corner and Creations does a matching dolly pattern for every one (EVERY one!) of their girl patterns. 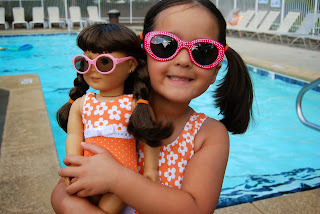 She loves to match her doll, Samantha! So cute! 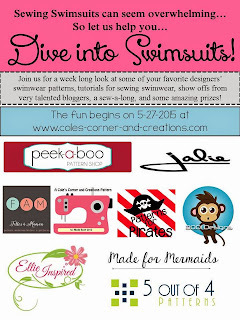 Another Cole's Corner and Creations swimsuit PDF sewing pattern is the Bow-A-Licious Bathing Suit. This was the very first swimsuit that I sewed up (ever!) and it was a great introduction to sewing swim knits. I won't lie- the inside of this bathing suit is pretty rough, but once I was finished, I was so proud of myself! 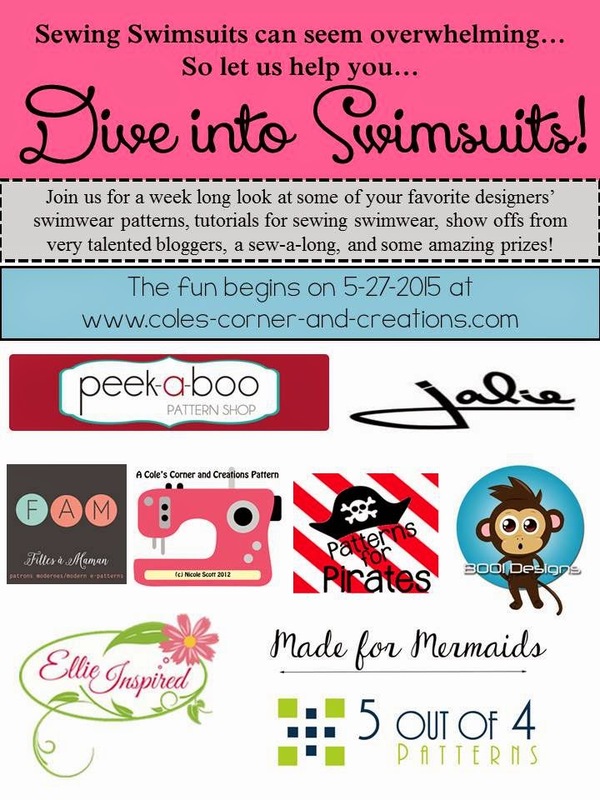 If you're like me, and would like to figure out how to sew a bathing suit, I would HIGHLY recommend starting out with Cole's Corner and Creations-Bow-A-Licious Bathing Suit! It's a GREAT starting point with a really satisfying end product. -The Bow-A-Licious Bathing Suit is written for sizes 1/2-16. 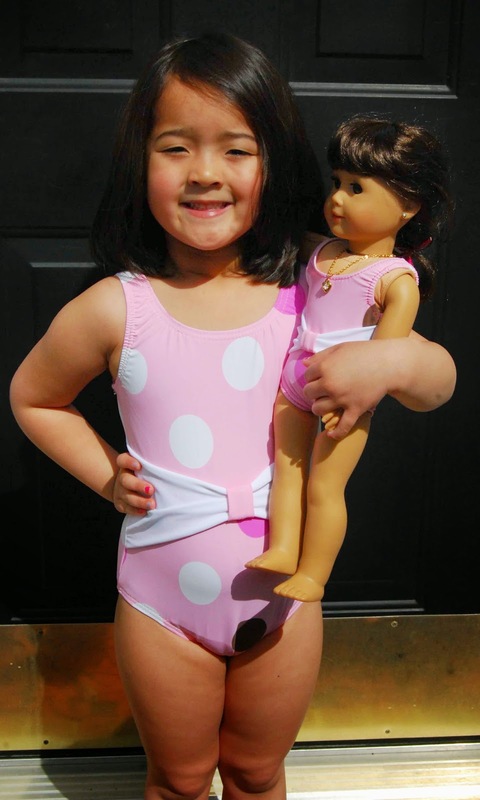 -The Bow-A-Licious Bathing Suit is a one piece bathing suit featuring a big bow that can be worn on the front, or the back (such a fun feature!). 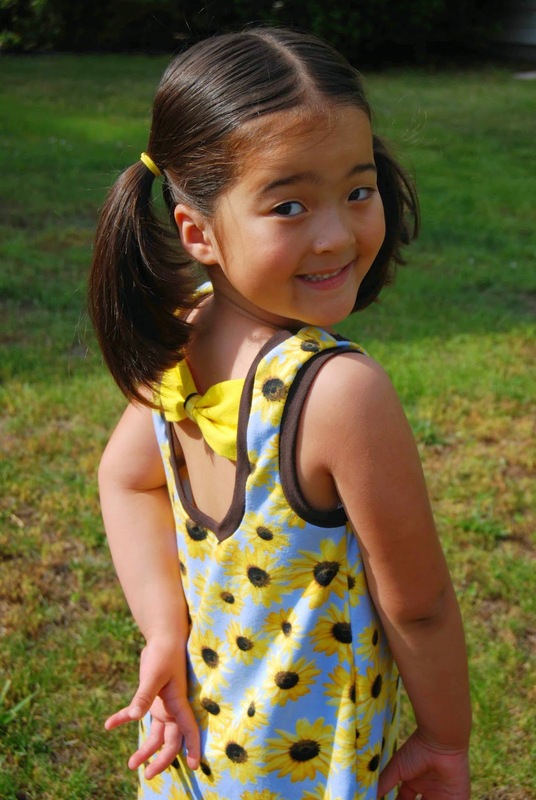 -The Bow-A-Licious Bathing Suit includes a sizing chart and fabric requirements chart. I sewed up a size six Bow-A-Licious Bathing Suit with reversible, solid-colored bow. As with The Lakehouse Swimsuit, the Bow-A-Licious Bathing Suit has great coverage. The neckline is nice and high and the leg holes are modest and stay in place. 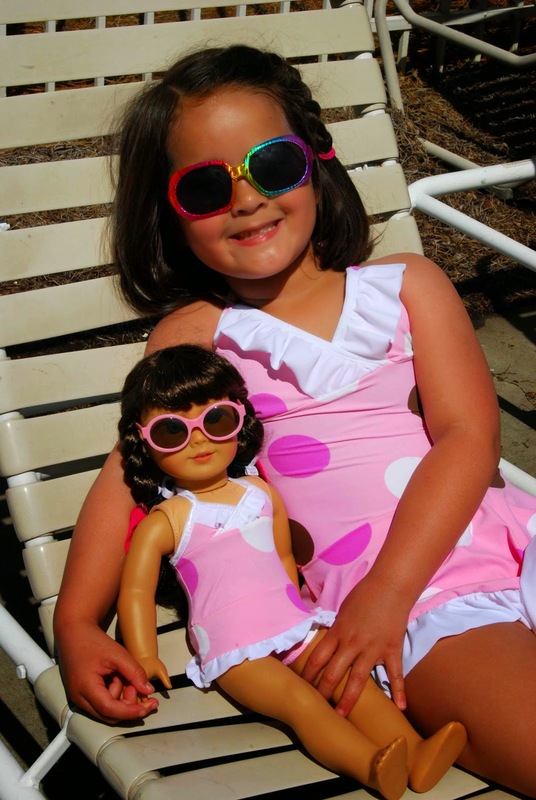 Lil' Miss LOVES the big bow feature on the Bow-A-Licious Bathing Suit! She likes to decide to wear the bow in the front, or the back. (Note, if you want the bow to be reversible, be sure to make the bow in a solid color). 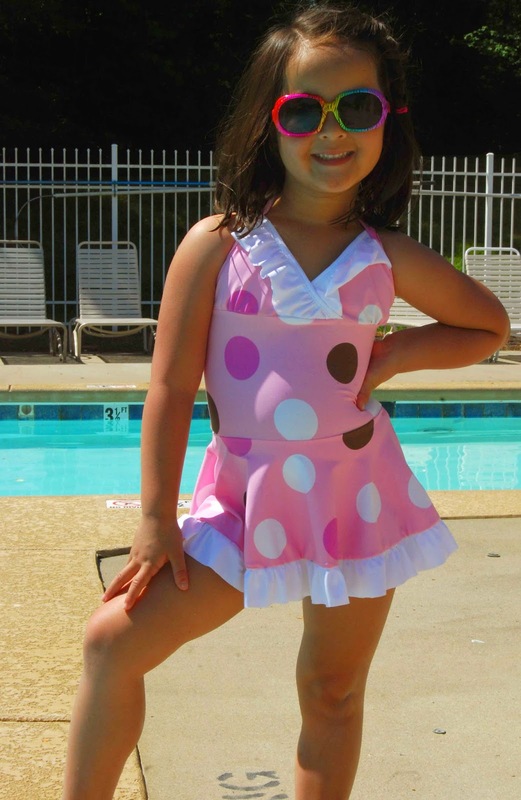 Since sewing up this pattern, she has worn this suit to swimming lessons every week and it has held up very nicely. Stroke after stroke, this suit has stayed in place- on the shoulders and no riding up on the bottom. 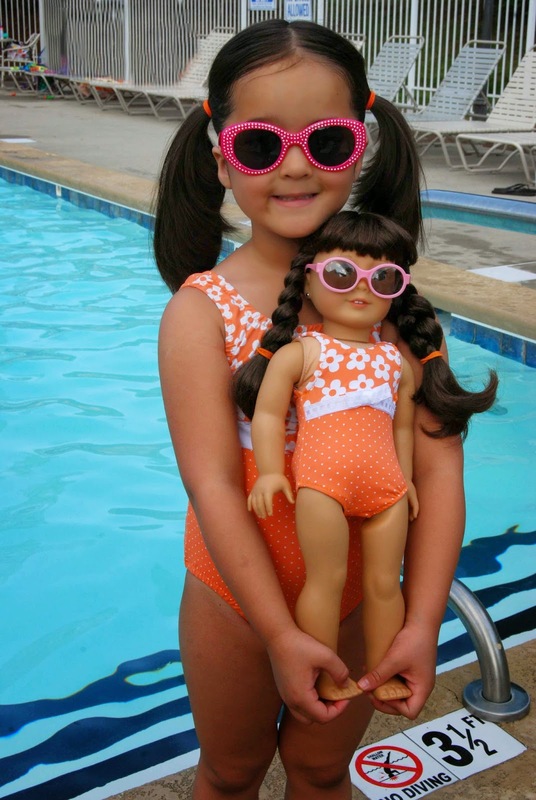 Of course, Samantha needed a matching Bow-A-Licious Bathing Suit! 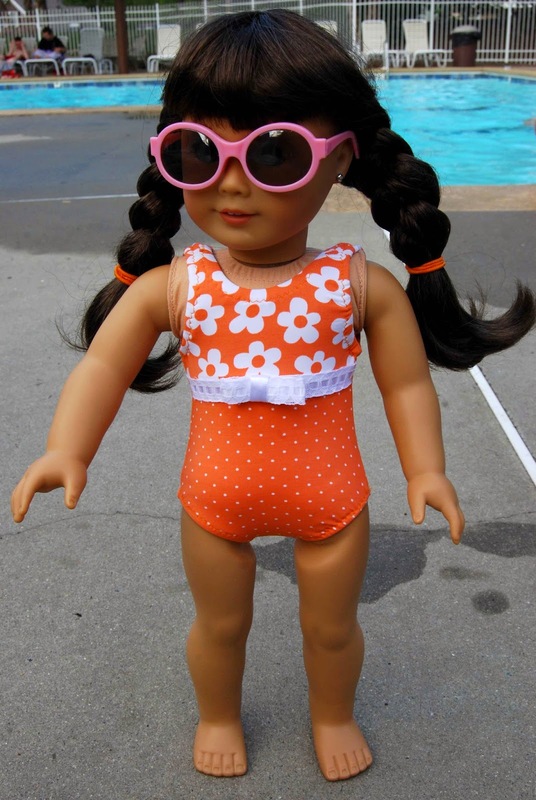 So, I sewed up a matching suit for Lil' Miss' favorite AG doll. Adorbs! Last, but no least, I sewed up Cole's Corner and Creations very first PDF sewing pattern, the All 4 One Stylish Swimsuit. While this pattern is a little older (and definitely not as refined, digitally, as the Lakehouse Bathing Suit, or the Bow-A-Licious Bathing Suit), the All 4 One Stylish Swimsuit is another great pattern to "get your feet wet" and start sewing with swim knits! Plus, the All 4 One Stylish Swimsuit is currently on sale for $3! Can't beat that- a great, inexpensive way to start sewing bathing suits (and, hopefully join us in the #diveintoswimsuits sew along!). -The All 4 One Stylish Swimsuit is broken into two different patterns (purchased separately); Sizes 1-5 and 6-16. -The All 4 One Stylish Swimsuit features four different views- Pin up, Modern, Frilly or Retro. -The All 4 One Stylish Swimsuit features three different strap placements- Traditional, Razorback or Halter. 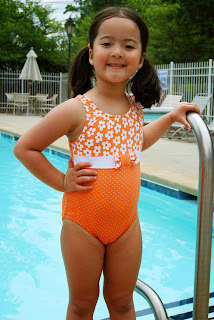 -The All 4 One Stylish Swimsuit PDF sewing pattern includes a sizing and cutting chart. 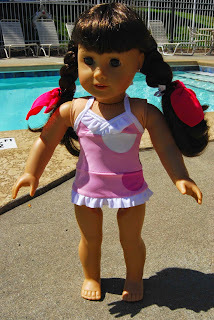 I sewed up a size 6/7 view Frilly, Halter strap placement, All 4 One Stylish Swimsuit. I do want to note that in the All 4 One Stylish Swimsuit, the size "6" is actually a size 6/7. (Lil' Miss is really more of a 5/6 in fit and sizing). Lil' Miss was most excited about this swimsuit pattern for two reasons; First, it had a skirt! She LOVES dresses and skirts and anything girly, so a skirted bathing suit is just about heaven for her! Second, I could make it so that it had halter ties- just like "Mommy's bathing suits." For some reason, she had it in her head that halter ties are more "sophisticated" and "grown up" when it comes to bathing suit attire... hahahahaha! I'm happy to report that the All 4 One Stylish Swimsuit delivered in it's promise to be both girly and "grown up" (at least in my five year old's eyes ;). She loved it! She had to put it on RIGHT AWAY and she was dancing and prancing around the house in the suit all evening. 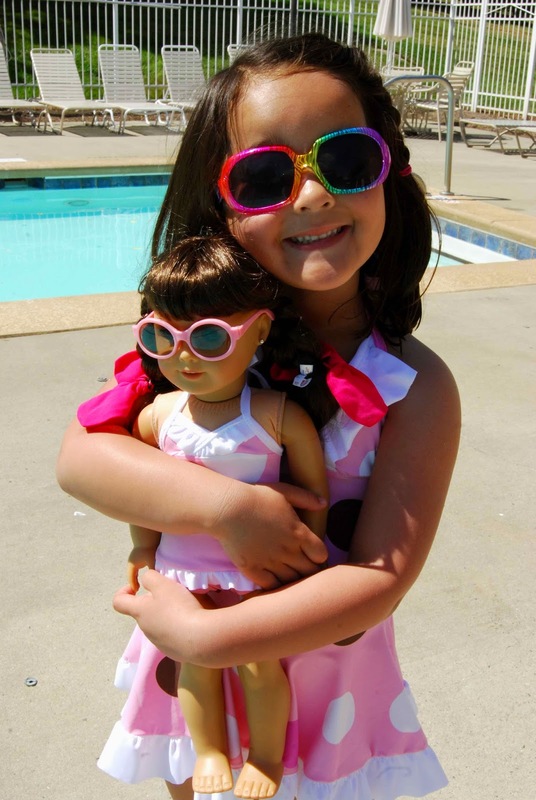 The All 4 One Stylish Swimsuit is a great compromise, when it comes to the world of little girls' bathing suits- it is girly and sweet, without being too revealing, or too high/low cut to be age-appropriate. Also, with the added circle skirt, there is no risk of "peek-a-boo" cheeky buns while at the pool. ;-) The top was a touch big on my daughter, but that is no surprise due to the difference in sizing. However, since I chose to sew the halter-style straps, I was able to pull the straps tight enough to make sure the top was snug and secure. Once again, I couldn't make Lil' Miss a new suit and NOT make Samantha a matching one... so, Samantha is now the proud owner of not just one, not two, but THREE new bathing suits!! That's a lot of suits for a non-swimming doll!! Ha! I was able to construct the dolly suit from just scraps and cuttings from Lil' Miss' suit. So, it didn't actually take any additional fabric. ******All swimsuit fabric was purchased from Chez Ami, before they went out of business. 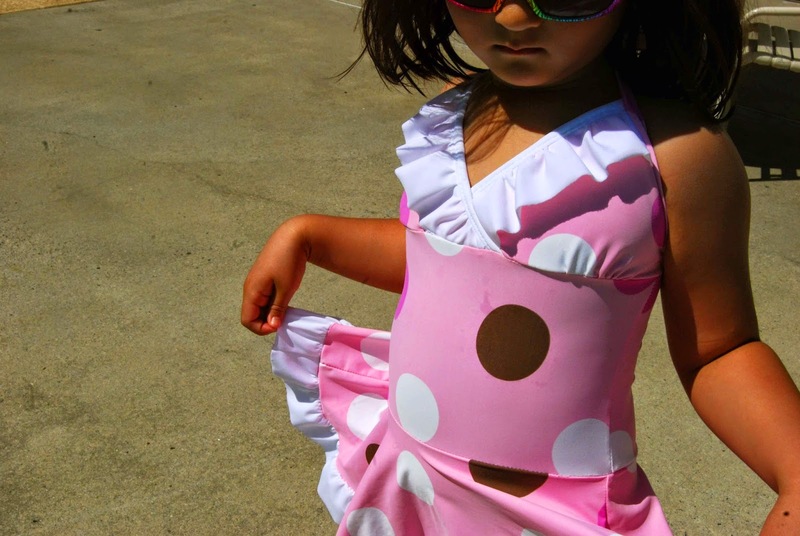 The pink polka-dots is SPF 50. 3/8" Swimwear elastic was purchased by the yard at my local Hancock Fabrics. 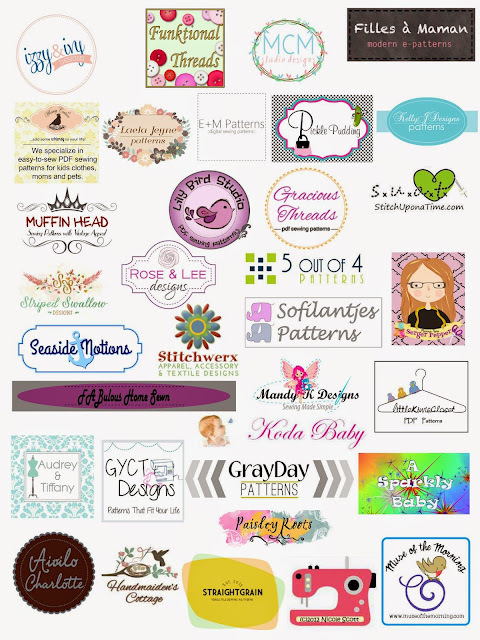 Dutch PDF sewing pattern designer, Sofilantjes, turned one this past week (Happy Anniversary!!) and they're celebrating with a fun blog tour, highlighting their very first pattern, the Summer Surprise Dress. 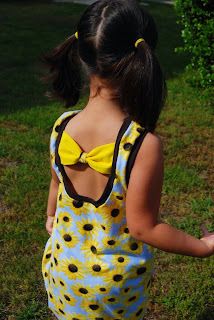 This sweet little sleeveless dress is a super quick sew that is perfect for the hot summer months. Love that! 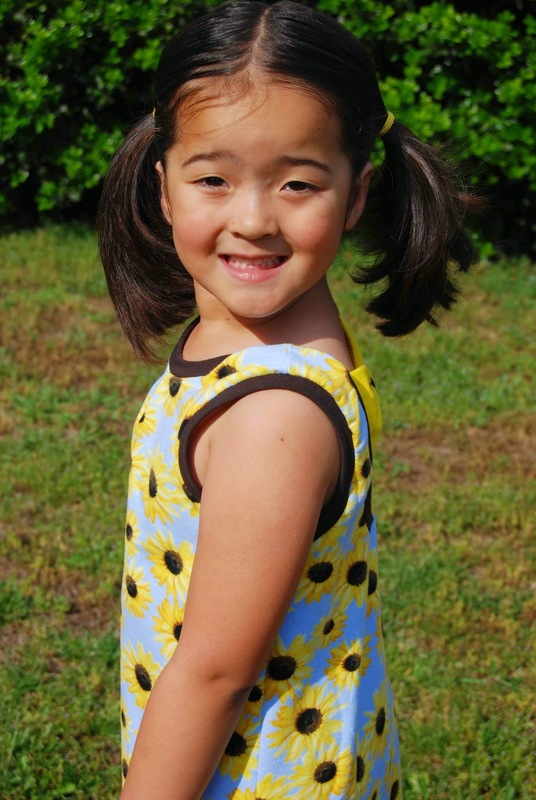 -The Summer Surprise Dress comes in sizes 6m-7y and then sizes 7y-12y (Two different PDF sewing patterns). -The Summer Surprise Dress is meant to be sewn using knit fabric. -The Summer Surprise Dress has three hem options- top, dress and tunic. -The Summer Surprise Dress features a simple box pleat front bodice and a gorgeous bow in the back. 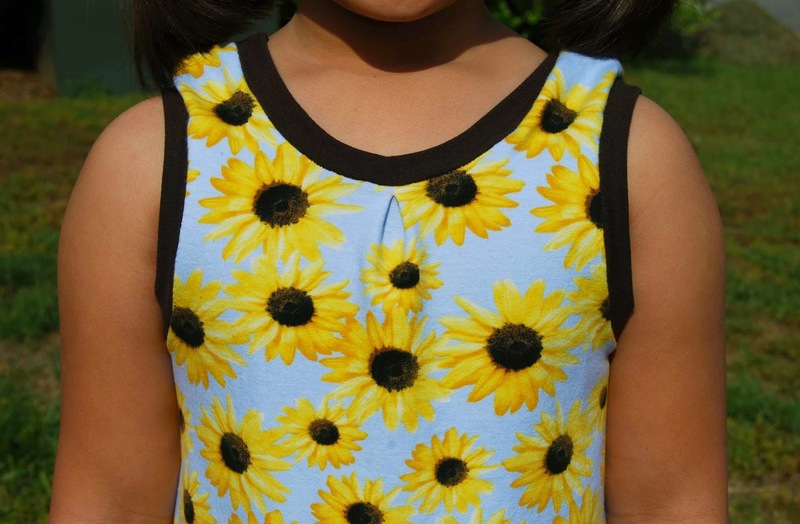 -The Summer Surprise Dress PDF sewing pattern features size layers (i.e. Print only the size that you need). This is a brand new, updated feature to the pattern. 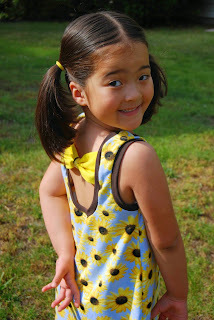 The Summer Surprise Dress has three pattern pieces- front, back and bow. There are measurements to cut the arm and neck bindings and bow center. I love when a PDF sewing pattern has minimal pieces to print, tape and put together! I also enjoy when PDF sewing pattern has size layers- that saves so much ink, time and erases any room for error when cutting out the pattern. Sewing up the Summer Surprise Dress was very straight-forward. I really enjoyed the simple, clear pictures in the tutorial. The flow of the tutorial felt intuitive and natural. I never questioned what a particular picture was trying to show me and/or illustrate. Simple, white arrows also helped to aid in my understanding of the pattern. There is a lot of set-up in the beginning of the Summer Surprise Dress tutorial. Instead of just skimming, be sure to really read through the directions and understand it- it really helped me while sewing! This dress was a really quick sew! It can be sewn on either a regular sewing machine (using a stretch stitch) or a serger. I used a combination of both. I definitely believe that the Summer Surprise Dress would be a great starting off point for somebody wanting to delve into the world of sewing with knits. 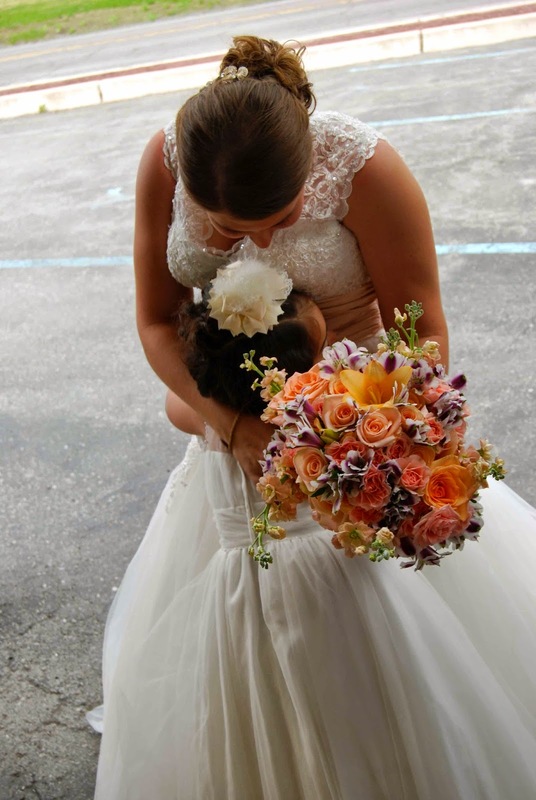 Now, let's take a moment to talk about the bow in the back of the dress- how cute is that!?! I love that the bow is self-enclosed (no raw edges and no bindings on the bow, itself). The bow adds a girly touch without being in the way. Cute and functional- that's always a winner in my book!! Quick sew! Comfy knit! 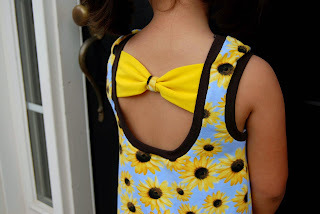 Cute bow back! I know that I'll be making many more of these Summer Surprise Dresses! Love! Congrats, Sofilantjes, on your milestone anniversary! Thank you for inspiring us with your story and your talent, Anne (the brains behind Sofilantjes). Thank you, for allowing me to take part in your blog tour- I really had fun sewing up the Summer Surprise Dress. Cheers to many, many more (and lots of fun, new patterns ;-)! Check out all of the awesome sponsors for this Summer Surprise Anniversary Tour! For your chance to win patterns from the list below, enter here! Please check out the 24 other talented bloggers (link below) that took part in the Summer Surprise Anniversary tour! Lots of talented ladies and their beautiful dresses displayed here! Preschool Graduation- Last Day of Preschool.... EVER!! We are so, so thankful for these two patient and loving teachers who have guided, shepherded and taught our daughter, this year! THANK YOU, Ms. Laura and Ms. Amy-Lyn! 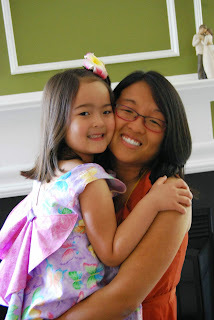 Today was Katy's last day of Preschool! Ted and I went to her Preschool "Graduation," this morning and she did a great job of singing, smiling and dancing! 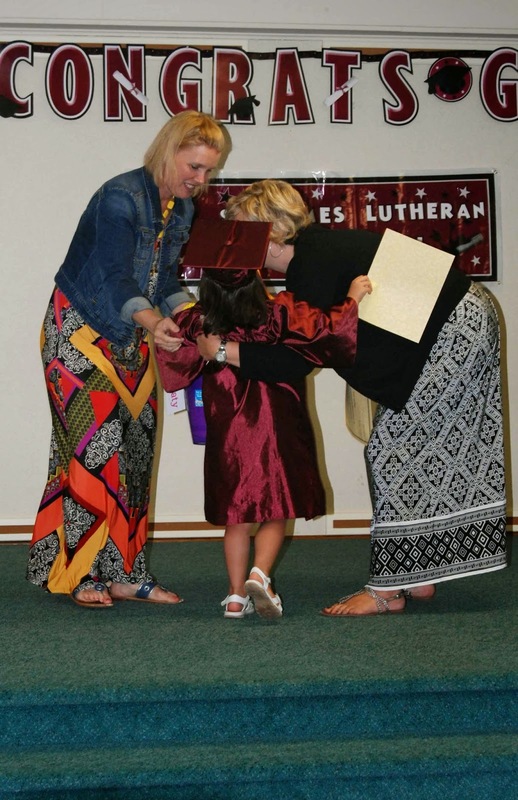 I am so thankful for the love and guidance that Lil' Miss received at St. James Lutheran Preschool these past three years. 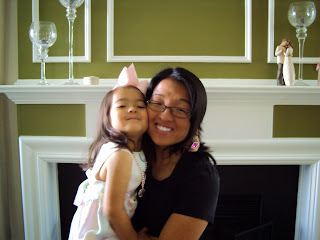 Thanks to the wonderful staff, Katy has had a wonderful, positive preschool experience (and by extension, so have I). 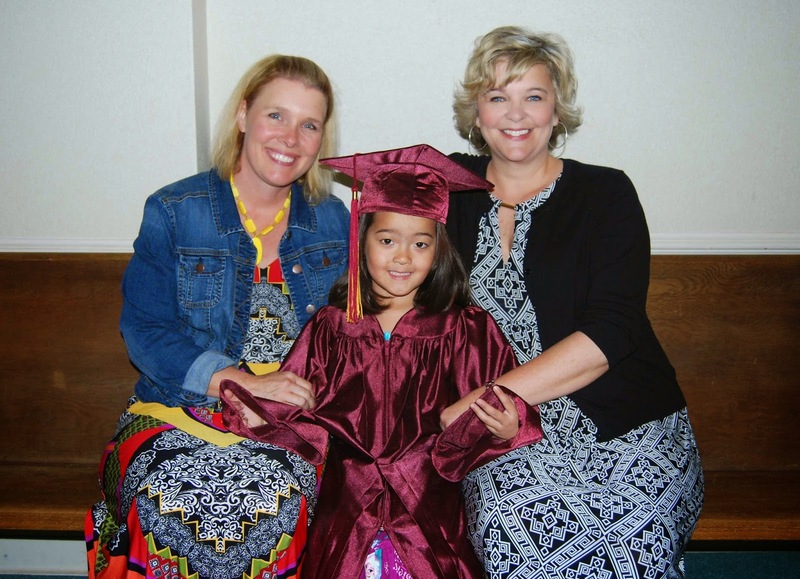 I am grateful that Katy always looked forward to preschool and that her introduction to the school experience had such a positive impact on her life. 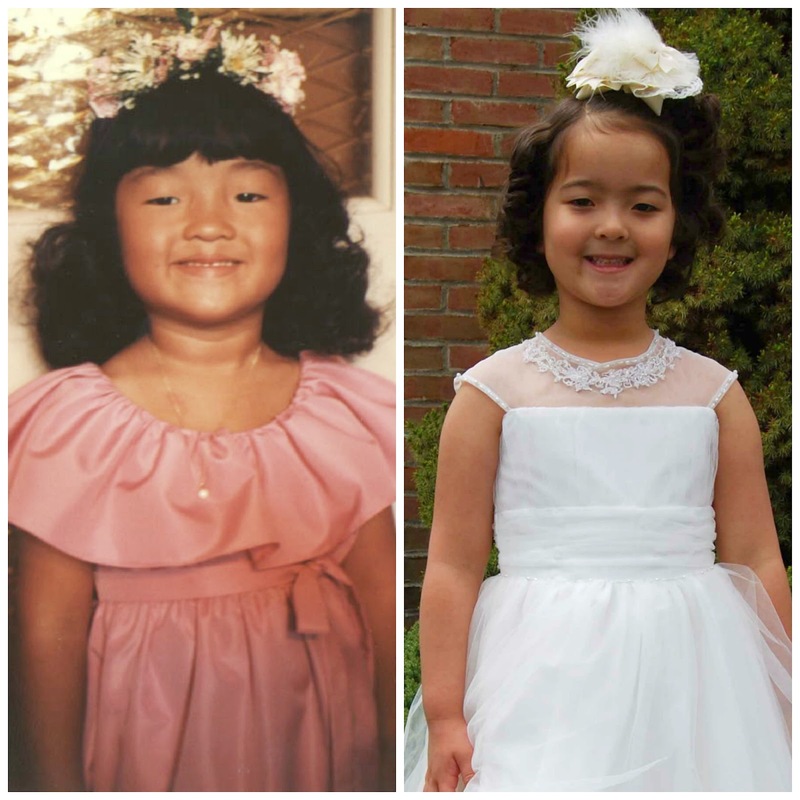 I am so, so thankful for her teachers that helped teach her, guide her, mold her and just loved her for being uniquely Katy! Thank you! 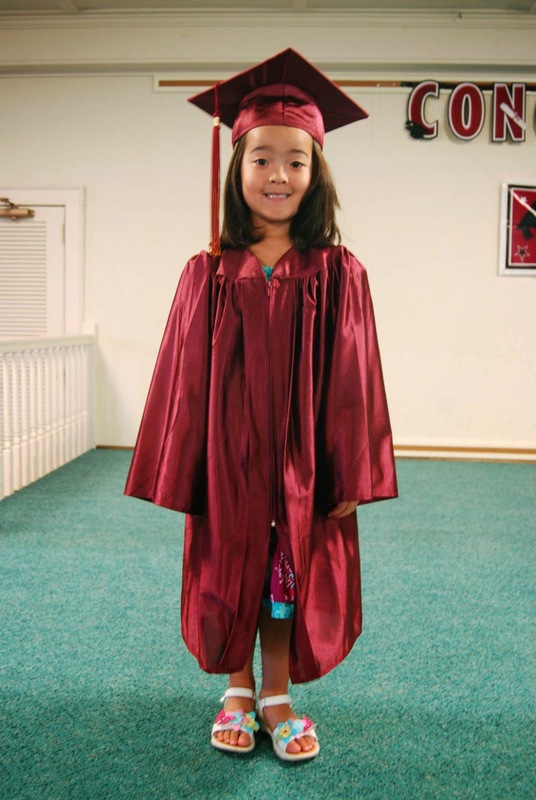 She has really grown and blossomed in just a few years at school and I know that she's ready for Kindergarten, next year! 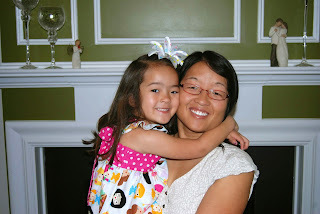 It is so hard to believe that we started on this Preschool adventure just three short years ago.... Now, if only time would just slow down just a little bit....! 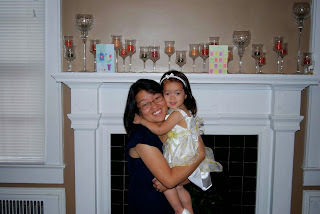 Another year, another Mother's Day! I wouldn't be celebrating this Hallmark holiday if it weren't for the birth of our beautiful daughter, Katy Grace, five short years ago. The days may sometimes feel oh, so long, but the years just fly right by....! I have thoroughly enjoyed the journey, thus far. I stand back in amazement at the fulfillment I have found in just five short years of motherhood. So, here's to the late nights, the sleepless nights, and the occasional well-rested nights. Here's to the down and dirty and the fun and happy! Here's to the wonder of childhood; the amazement, the beautiful awe of observing life anew through the eyes and discovery of your own child. Here's to every inquisitive question and every difficult answer. Here's to the hard choices, the difficult choices, the life-altering decisions that define us as a person, as a family and helps to mold and form our child into the person that they will one day become. Here's to the future- our future, her future, the future. 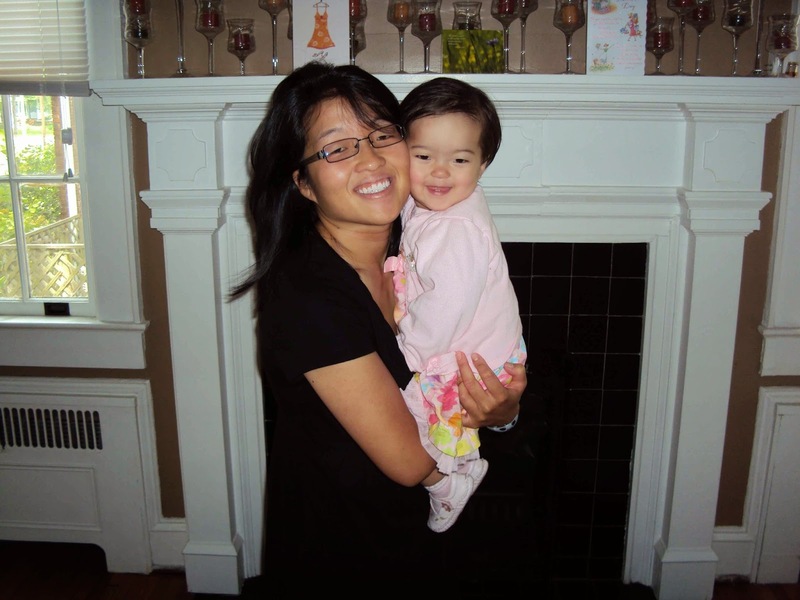 Simply, Happy Mother's Day 2015! 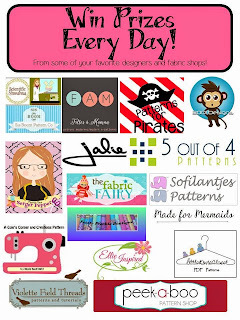 Hello, Pattern Revolution-ers!! 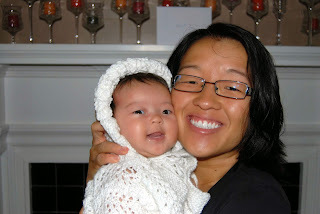 Here's my second pattern for the Pattern Revolution Women's BundleUp blog tour- the ModKid , Malibu Misses Dress! -The Malibu Misses Dress is written for sizes XS-XXL. -There are two skirt length options for the Malibu Misses Dress- Mini or Maxi. -There are two back options for the Malibu Misses Dress- Cross Over or Full. -The Malibu Misses Dress is meant to be sewn in knit fabric. 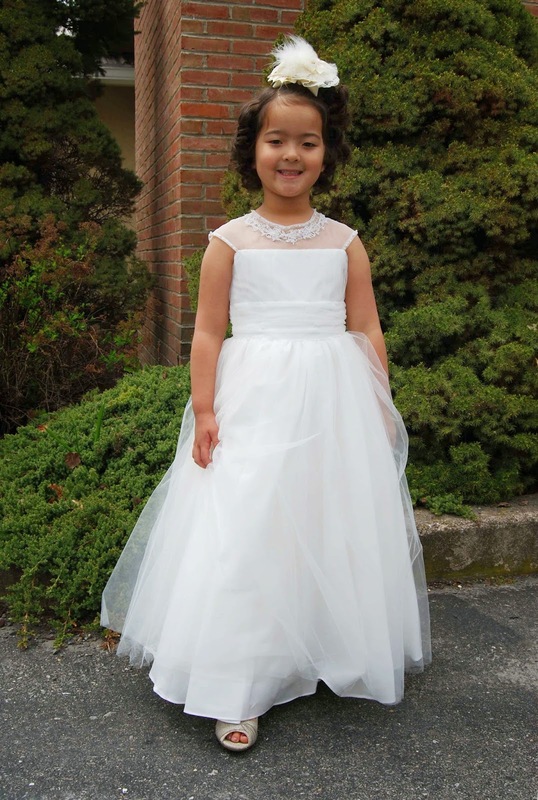 -The Malibu Misses Dress PDF sewing pattern includes a fabric requirements chart, a sizing chart, cutting instructions and pattern layout diagram. I sewed up a size small in length and size medium in width. At just 5'-0" (at least that's what my driver's license says ;-P), I'm short- what can I say?! I did the full back, mini skirt options. While I love the cross-over back option, I only had enough fabric for the full back option. C'est le vie! Next time, next time.... Also, I feel that it's worth mentioning that the "mini skirt" version isn't really what I think of as a "miniskirt" (ie, I hear "miniskirt" and I automatically have an 80's flashback to tight, short, mini jean skirts that barely covered the necessities). The ModKid Malibu Misses Dress is not such a dress. It is perfectly proportioned and the length of the dress hits right at the knees. All fabric came from the Purpleseamstress fabrics, online. I sewed exactly as instructed, with no modifications. The Malibu Misses Dress is an all-knit pattern. So, I used my serger for most of the construction of this dress. 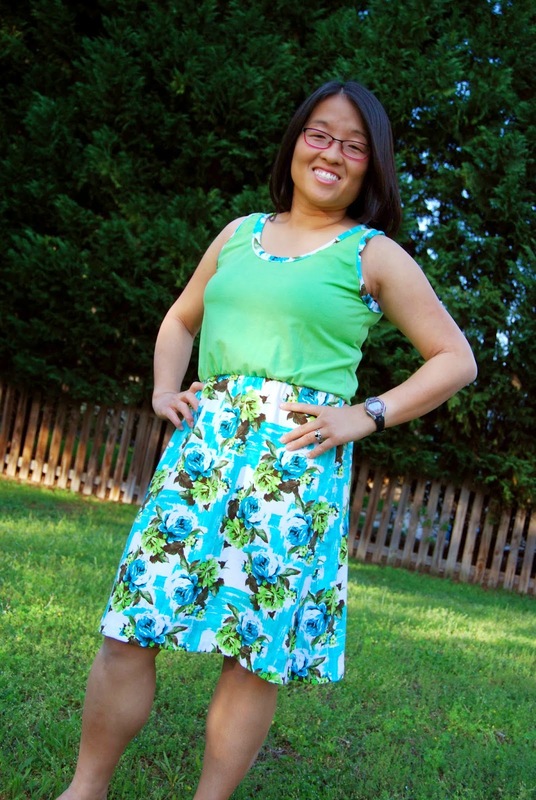 I did use my regular sewing machine to topstitch around the neck and arm bands and hem the bottom skirt. It's a quick sew- it probably took me two hours from start to finish. I love a quick sew! 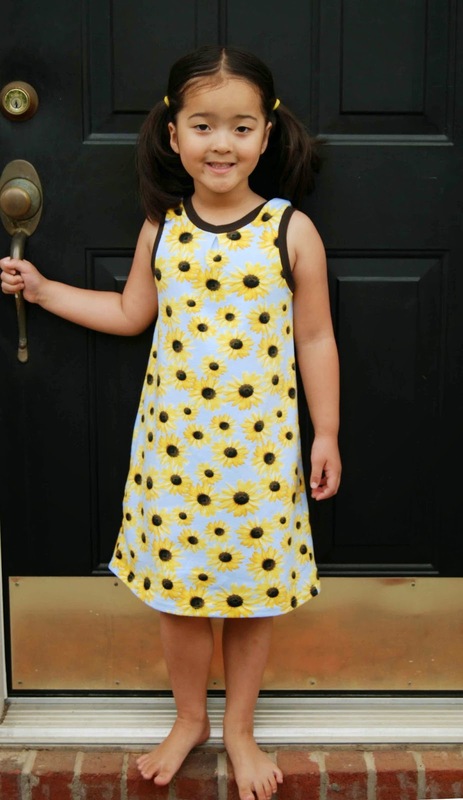 The Malibu Misses Dress PDF sewing pattern includes simple, step-by-step diagrams and illustrations. With very clear labels and shading, the Malibu Misses Dress directions are easy to follow and easy to understand. There are inspiration photos at the beginning and end. The Malibu Misses Dress only has pattern pieces for the front and back bodices. The bindings and skirt are all done from a cutting chart. So, there are minimal pieces to print, cut and tape together- one of my favorite types of patterns! 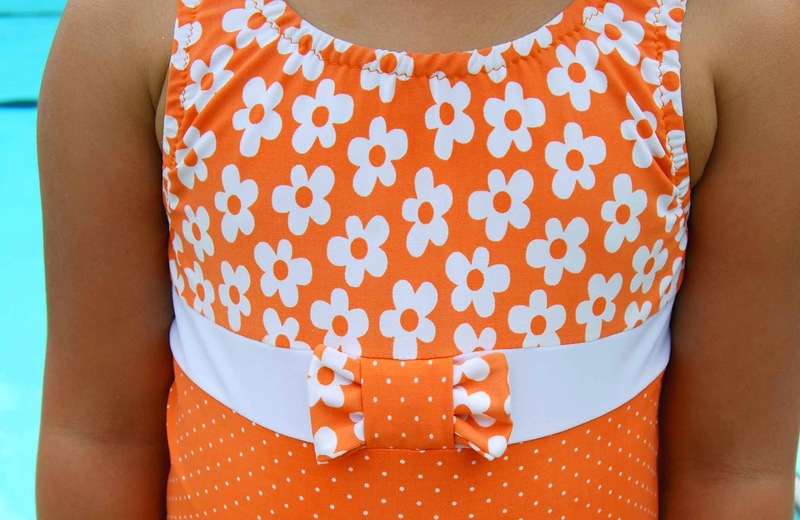 My only suggestion for the ModKid Malibu Misses Dress PDF sewing pattern is that I wish that it included set measurements for each arm band and neck band (as opposed to just instructing me to cut two WOF strips from my band material). I like to have at least a guideline band measurement so that each arm is even. I love that the Malibu Misses Dress fits so perfectly into my own personal style. It's easy to sew and it's easy to wear. It's casual, yet put together. I definitely see lots more of the Malibu Misses Dresses in my future!! 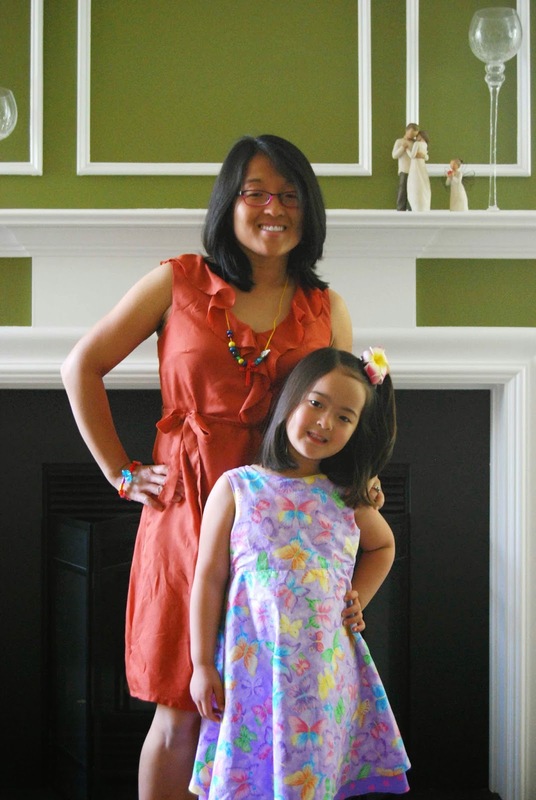 If you would like to purchase the ModKid Malibu Misses Dress PDF sewing pattern (along with some of the other great patterns included in this season's Pattern Revolution Women's BundleUp ), please go here. You won't be disappointed! Happy Sewing! Please check out some other wonderful creations sewn up by other talented bloggers using the Pattern Revolution Women's BundleUP patterns! Today is my turn on the Pattern Revolution Women's BundleUP Tour and I couldn't be more excited to share my latest sewing project with you! I sewed up the Golden Rippy Mykonos Tankini Collection. You heard me correctly- I sewed MYSELF a bathing suit! I mean, what kind of crazy person does that sort of thing?!?! Me, that's who! And, with the Golden Rippy Mykonos Tankini Collection PDF sewing pattern, you can, too!! -The Mykonos Tankini Collection comes in Ladies sizes XXS-XXXL. That's a generous size range! -The Mykonos Tankini Collection is a mix and match pattern- there are three top options (Empire waist, Peplum and Triangle Top) and three bottom options (regular bikini bottoms, skirted bikini bottoms and boy shorts). YOU choose which bottom and which top most flatters your figure! -Sizing chart, fabric requirements chart, cutting guide and pattern layout guide are all provided in the Mykonos Tankini Collection PDF sewing pattern tutorial. The great thing about sewing something for yourself is the fact that you can alter it to fit your body- bumps, lumps and all! I sewed the regular bikini bottoms and the (modified) empire waist top. I sewed up a small (bust and bottom) but graded out to a medium for my waist. I bought my swimsuit fabric, swimsuit lining and swim elastic from Hancock Fabrics. First off, the directions for the Mykonos Tankini Collection are nice and clear. 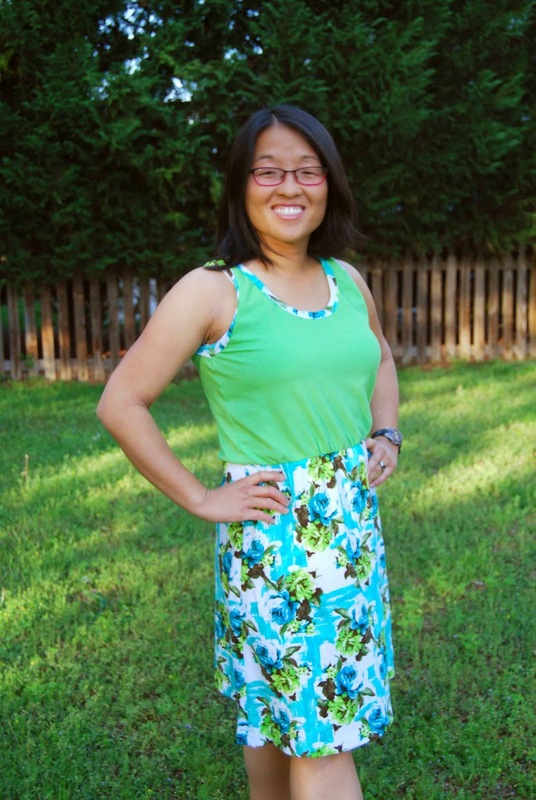 This was my first time using a Golden Rippy PDF sewing pattern. Up until this point, I've never sewn myself a bathing suit. So, I needed a pattern that would hold my hand and tell me exactly what to do, when to do it- the Mykonos Tankini Collection does just that! Simple shaded illustrations with helpful arrows accompany each step-by-step direction. I really enjoyed the fact that the Mykonos Tankini Collection has lots of great options to create the perfect bathing suit for you and your body type. There are three options for both bottoms and top. It's just like shopping for a suit, but better because you get to determine the fit! Now, let's talk about my modifications (not included in the Mykonos Tankini Collection PDF sewing pattern). I first sewed this suit up in one evening- the bottoms were a cinch and fit me perfectly. There were no modifications to the bottom- I love the way they fit- great coverage in the back and they sit perfectly on my hips. The top, on the other hand.... well.... let's just say it wasn't a perfect fit. I don't necessarily believe it was the pattern's fault- I just wanted a suit that fit me and my proportions better. So, after scrapping my first top (I would HIGHLY recommend making a muslin of this suit. That way, you can get a feeling for the fit and styling and adjust accordingly), I started over (on my top). On my scrapped, first attempt top, I noted what worked and what didn't. Then, using the Mykonos Tankini Collection as my guide, I made a top to fit me. -I took the Empire waist pattern piece and lengthened the bottom hem of the top by 5". -I added a 10"x2" panel on the inside, sides to create ruching (aka, conceal any extra "fluff."). -I added a "cinch" to the center bust panel to help define the area. -I took the front top piece and doubled it in height. Then, I gathered the sides of my extra piece and attached it on top of another front top piece (cut to correct size). -Last but not least, instead of making two straps to tie together around the neck, I just made one. Sewing the elastic into the teeny tiny strap tube just about did me in. One was all I could manage! So, I took my one strap, measured around my neck and sewed it into the suit permanently- nothing to tie, or bother with while chasing after my little fish at the pool! Overall, I was really pleased with the Mykonos Tankini Collection PDF sewing pattern. It really helped me overcome my fear (and the mystery) of sewing myself a bathing suit. By using the Mykonos Tankini Collection as my base and guide, I was able to create a bathing suit that had just the right amount of coverage and support for me. Love that! Now, go forth and purchase the Mykonos Tankini Collection as part of the Pattern Revolution Women's BundleUP sale! There are so many great patterns included in the sale- you won't want to miss the bundled pricing.